March saw, once again, central bank guidance essentially driving markets. US Federal Reserve Chairman, Jerome Powell, continued his back-pedaling on rate policy, saying now that interest rate rises could be on hold for “some time”, as global risks weigh on the economic growth outlook and inflation remains muted. The European Central Bank (ECB) pushed back the timing of any rate hike to next year at the earliest, whilst announcing a new round of multi-year refinancing loans for European banks. This dovish mood proved a strong tailwind to the dominant bond positions of the Next Edge AHL Fund (the “Fund”), and the month saw a return of 1.24% (Class A Units), despite small losses in commodities, stocks and FX trading. Lower yields pushed strong performance from long positions in European and US government bonds, particularly French OAT bonds, which were top performers. These outweighed the smaller number of modest losing positions, such as UK gilts and South African swaps. Stock trading was more mixed. The Fund made gains in Europe and the US through positions in defensive sectors such as utilities and food, beverage and tobacco. However, these were outweighed by losses on long positions in Asian indices. The price of natural gas in the UK continued its six-month downward path, falling over 20% on more unseasonably warm weather, and the Fund profited from short positions in both UK and US gas markets. In contrast, losses were seen on short silver and gold in metals as well as long lean hogs in agriculturals. FX trading was also challenging, as gains made on a long Indian rupee position were outweighed by losses on a range of markets, including South African rand and Turkish lira. The later saw political pressure from President Erdogan temporarily drive lira liquidity from the London market towards month end, whipsawing the market and impacting Fund positioning. 3. Managed Futures: Barclays BTOP50 Index. 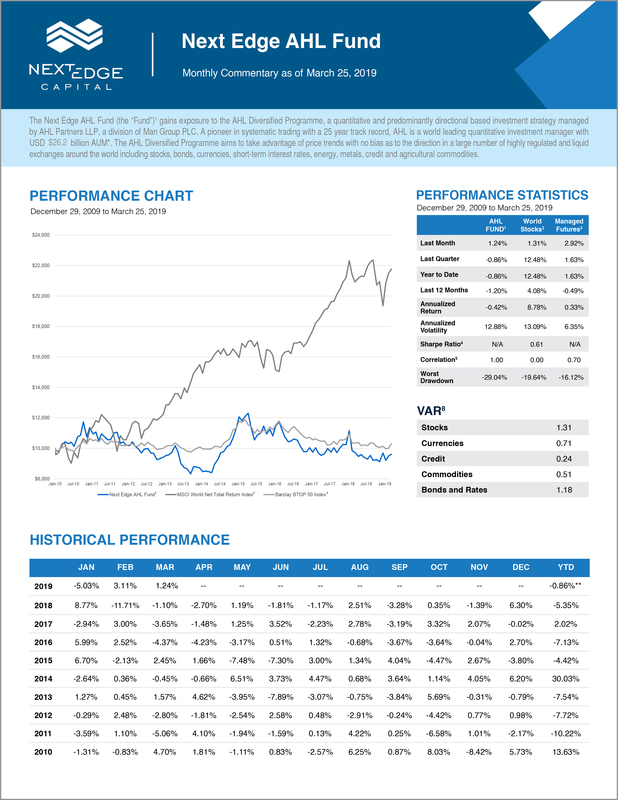 The historical annualized rates of return as of March 25, 2019 are 1-yr -0.49%, 3-yr -3.48%, 5-yr 0.71%, 10-yr N/A, and CARR 0.33%. When 12 months of performance data is unavailable for a calendar year, partial year to date is shown. The indices shown are not benchmarks as they are not representative of the Fund’s investment strategy. They shall be used as a comparison of investing in other asset classes only. The investment strategy of the Fund is similar to the above indices as it involves investing in stocks; but the Fund also invests in bonds, currencies, interest rates, energies, metals, credit and agriculturals.